Packed full of triple coconut (coconut milk, coconut extract, and shredded coconut! 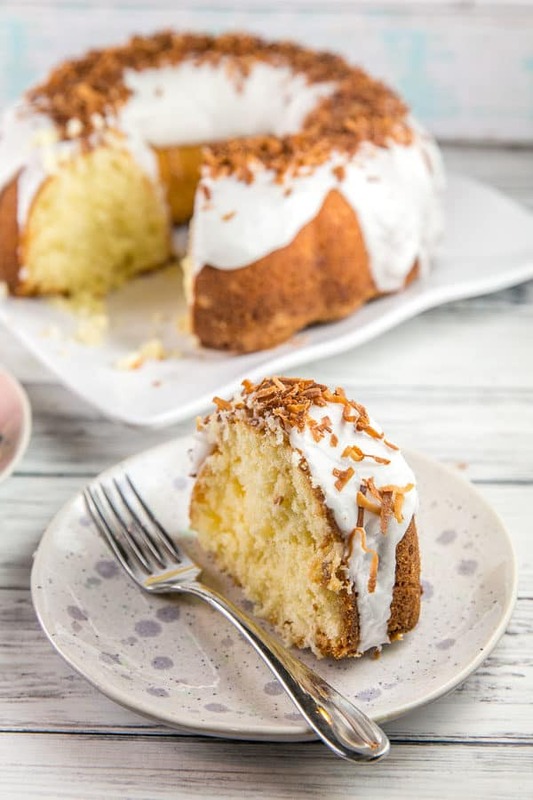 ), coconut bundt cake is incredibly moist and delicious. 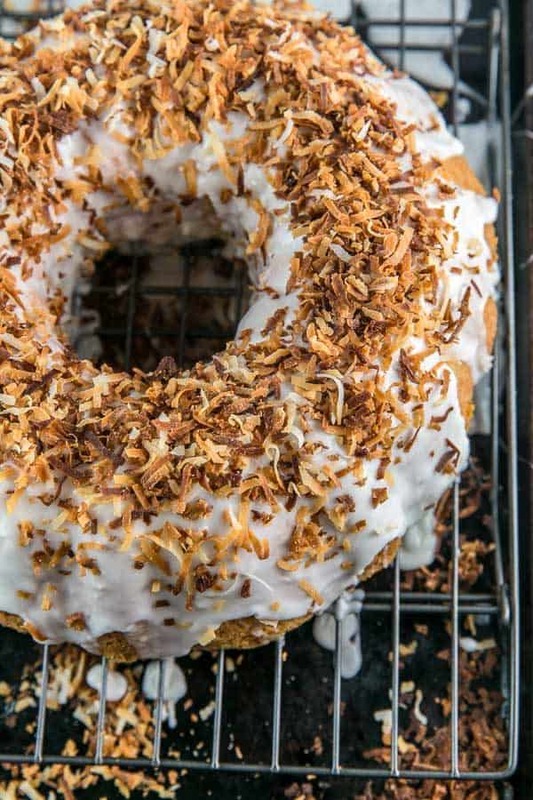 Don’t forget the coconut milk glaze and toasted coconut on top! Perfect to welcome spring, celebrate summer… or fight away the winter blues! Usually when I work on recipe development, I’ll make something, take lab notebook worthy notes (#scientistlife), and set them aside for a little while. 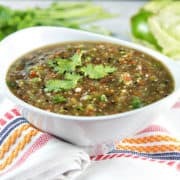 So usually, the recipe development process plays out over a long time range. 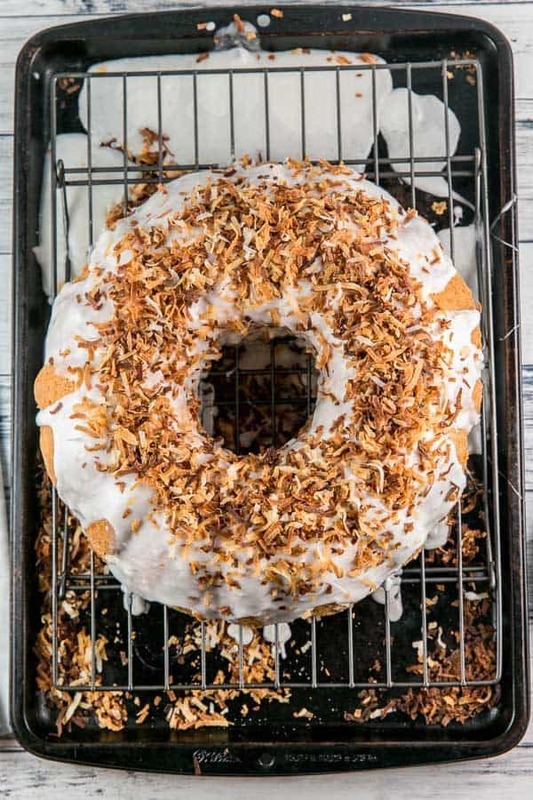 Except in the case of this coconut bundt cake. I just really, really wanted to get a coconut bundt cake recipe up before spring and I knew I was *so close* to getting it right. Ready for a little kitchen chemistry? Sugar and flour should be a roughly equal ratio (by weight, not volume). The eggs and the fat should be roughly equal (again, by weight). The liquid in the cake (including the eggs) should weigh roughly the same, or a little more than, the sugar. 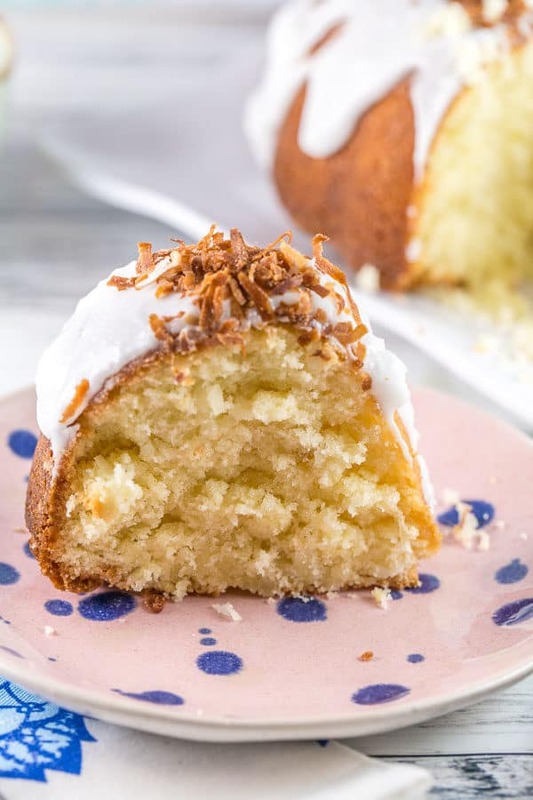 But, you know, rules are made to be broken… or at least bent a little, in the case of this coconut bundt cake. My biggest complaint about flavored cakes is that the flavor is often way too mild. 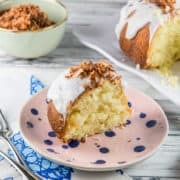 If I’m eating a coconut bundt cake, I want coconut to be the foremost flavor. And so, I pushed all the limits. Add in some coconut milk! Pour in half a bag of shredded coconut! How much coconut flavor can we pack into this cake and still keep a cake structure? The answer took four tries. Let me tell you, each of the “failed” cakes was delicious. Like, outrageously so. But they collapsed into the pan or crumbled when I tried to cut them. And while I will happily eat a crumbly, moist, super coconutty cake, if I’m going to share it… it should resemble a cake when it’s done, right? Right. So back to the drawing board we went again (and again) (and again) to make the most coconut-filled cake possible, while still maintaining a cake-like structure after cutting into it. And this coconut bundt cake was well worth the effort, because I’m going to go ahead and call it perfect. A slightly crispy, toasted coconut outside. A light, airy, extra moist inside. Enough structure to create a clean slice. 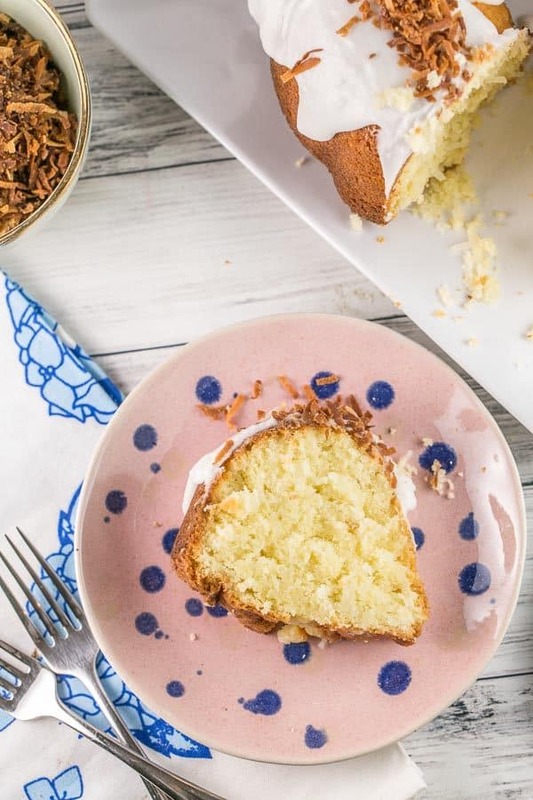 A coconut milk-based glaze and toasted coconut. Packed with coconut flavor. Nailed it. My husband may have had enough coconut bundt cake to last a lifetime, but I sure haven’t. I’m already regretting giving all those slices away to my neighbors. Packed full of triple coconut (coconut milk, coconut extract, and shredded coconut! ), coconut bundt cake is incredibly moist and delicious. Beat together the butter and sugar in an electric mixer on medium speed. Add in the eggs, one at a time, and mix until light and fluffy. Add the coconut extract and vanilla extract. Reduce mixer speed to low and add in the baking powder, salt, and half the flour. Add the coconut milk, followed by the other half of the flour. Mix just until no streaks of flour remain. Fold in the flaked coconut. Grease and flour a 12 cup bundt pan. Bake for 50 minutes, or until the top of the cake springs back when touched and a toothpick inserted into the center comes out clean. Cool in the pan for 10 minutes, then invert onto a wire rack and cool completely. 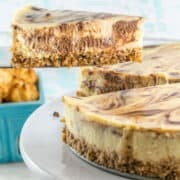 To make the toasted coconut, spread the remaining flaked coconut on a sheet pan and bake at 350 °F for 8 to 10 minutes, stirring every 2 minutes to prevent the coconut from browning. Cool completely. 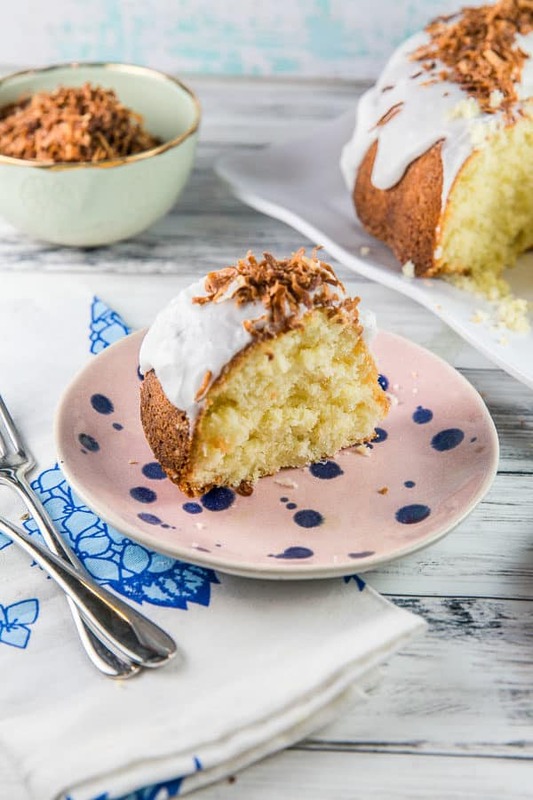 Whisk together the confectioners sugar, coconut milk, and coconut extract to make the glaze. Thin with additional coconut milk if a thinner glaze is desired. Spread on top of the cake, followed by the toasted coconut. So many of your recipes appeal to me for the way I cook. I’m not, however, a fan of social media. 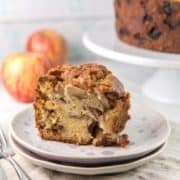 I sometimes wish to email a great recipe, like this one, to friends who love to bake. Why isn’t there a ‘button’ up there with facebook, pininterest, twitter, etc., for emailing? I hope you can make that change; it would make things so much easier for the tech challenged of a certain age! 🙂 And thanks for the delicious recipes you share! Hi Rita! I’m so glad to hear you like the recipes, and thanks for your feedback! I actually used to have an email button, but email buttons in browsers work based on your own personal settings on your computer and in your browser. 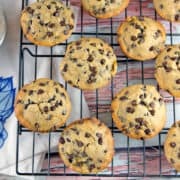 I would get so many emails from people complaining that when they clicked the button to email the recipe, their computer automatically opened Microsoft Outlook or Apple Mail, which they didn’t use. I can’t control this; it’s entirely based on their personal settings in their browser, but people wanted me to figure out how to fix it. So to eliminate the issue, I removed the email button altogether. If you’d like to email the recipe, the best way is to copy and paste the URL into an email! I love coconut cake! 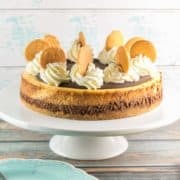 This sounds like the perfect dessert for me to make this weekend! Oh that looks out of this world. I love toasted coconut on everything lately … yogurt, pudding… but this takes the cake (haha). I used to be a chocolate only girl but you are changing my mind with this! I LOVE coconut cake…my fave. Your version looks moist and full of flavor. I reallllllllly wish I was sitting here eating a big piece!! I am enamored at bakers! Your scientific explanation of the adding of ingredients is amazing! 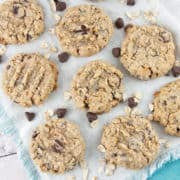 I absolutely love coconut and I am sure I would have loved your first few tries! 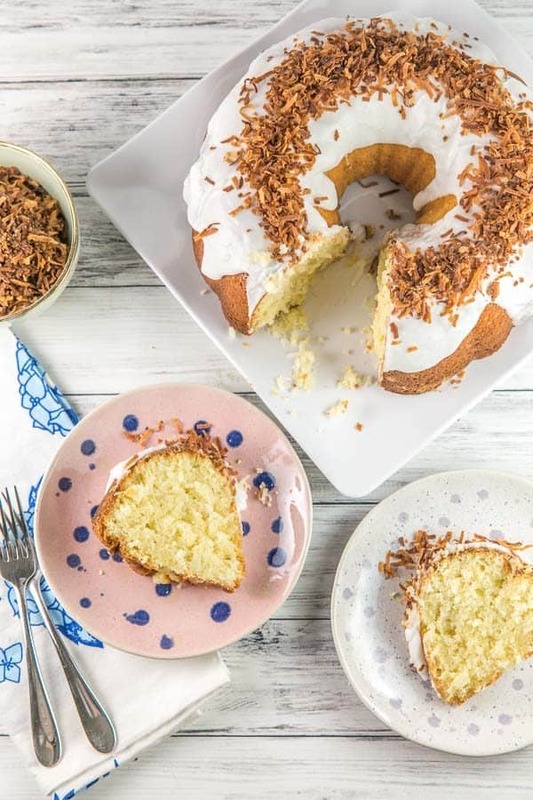 This cake looks extremely moist and flavorful The toasted coconut garnish is fantastic! You must open a bakery along side your scientific lab! Your husband is caked out? Just so I am clear, he is sick of cake? I’m sorry. He can’t be normal. 😉 This looks like a great dessert that I am not sure I would ever get sick of. Hahaha! He was coconut caked out… not caked out, in general. I don’t think he could ever possibly be chocolate caked out! 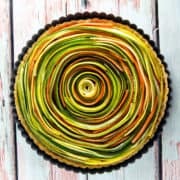 This is a beautiful looking cake. I can see why you are regretting giving it to your neighbors! Coconut is such a great flavor in a cake and I, too, would want to taste it. The slice looks clean and the crumb perfect, so yes, you nailed it 😉 . Wish we were your neighbors 🙂 . This cake looks scrumptious! I can totally imagine eating it three weeks in a row and still enjoying it just as much as the last time I had it! I don’t think I could ever get tired of coconut, it is by far my favorite flavor! This bundt cake looks so fluffy and moist…pure perfection. On a side note, I recently had the same situation as you with recipe testing. It took me 5 attempts to get a lemon cake recipe just right! Glad to know I’m not the only one who sometimes has to go back to the drawing board multiple times! Ooooh, that lemon cake sounds amazing. I love everything lemony!! omg all that coconut!! I am in love! And I suppose there are worse things to have had to make so many times, right?? It looks like your attempts paid off- this is perfect! Looks amazing and the addition of coconut milk must add a complexity that is hard to resist. I love that photo on the cooling rack with the frosting flowing down. Yum! 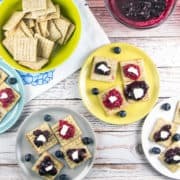 This looks like a delicious family dessert! I can’t wait to try your recipe!